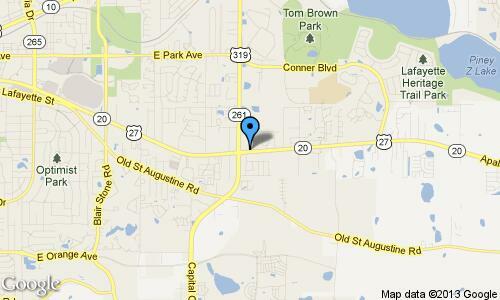 The Storage Center in Tallahassee, Florida is conveniently located on Apalachee Parkway and Capital Circle SE. Local businesses and developments of Leon County are just a short drive away from our storage facility. Heading west on FL-20W/US-27N/Apalachee Pkwy The Storage Center will be on your right less than 100 yards before Capital Circle (FL 261/US 319). Heading east on I-10E, take exit 209A and merge onto Mahan Dr (FL 10W/US 90W) toward Tallahassee. Turn left at Capital Circle NE (FL 261/US 319) and another left at Apalachee Pkwy (FL 20/US 27). Make a U-turn at Cay Ln and The Storage Center will be on the right. Head east on W Osceola St toward S Martin Luther King Jr. Blvd., and turn right on S Adams St. Turn left on E Magnolia Dr and right at Apalachee Pkwy. Make a U-Turn at Cay Ln and The Storage Center will be on the right. Head east on W Tennessee St (FL 20/US 90) toward N Monroe St, and turn right to head south on N Monroe St (FL 373/US 27). Turn left on Apalachee Pkwy (FL 20/US 27). The Storage Center will be on your left just after Capital Circle SE (FL 261/US 319). Head north and turn right at Capital Circle SW (FL 263). Turn right at Apalachee Pkwy (FL 20/US 27) and make a U-turn at Cay Ln. The Storage Center will be on your right. Click here to visit our sister location on Tharpe St.!